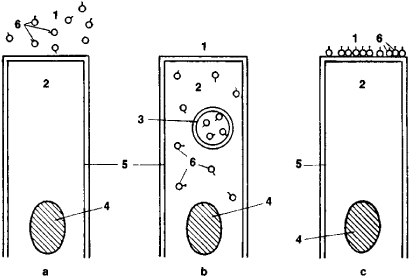 the process of the mechanical grinding and chemical splitting of food into nonspecies-specific components suitable for absorption and participation in the metabolism of animals and man. Most chemical reactions in digestion are en-zymatically catalyzed. After entering the organism, food is thoroughly processed by a variety of digestive enzymes that are synthesized by specialized cells. Complex food substances—proteins, fats, and carbohydrates—are split into smaller fragments by the addition of water molecules (see HYDROLYSIS). Proteins are eventually split into amino acids, fats into glycerin and fatty acids, and carbohydrates into simple sugars. These comparatively simple end products are absorbed, after which they are used to synthesize new complex organic molecules in the organs and tissues. Three main types of digestion are recognized: extracellular, intracellular, and membrane mediated (see Figure 1). With intracellular digestion, the unsplit or incompletely split food substrate enters the cell, where it is further hydrolyzed by enzymes in the cytoplasm. This older type of digestion is common among higher animals, among all unicellular animals, and among some lower multicellular animals, for example, sponges. In higher animals, white blood cells and the reticuloendothelial system have phagocytic properties, and cells of ectodermal and endodermal origin exhibit a variety of phagocytosis called pinocytosis. Intracellular digestion occurs not only in the cytoplasm but also in special intracellular cavities—digestive vacuoles—that are either permanent or formed only during phagocytosis and pinocytosis. It is assumed that lysosomes, whose enzymes enter the digestive vacuoles, are capable of participating in intracellular digestion. With extracellular digestion, enzymes that are synthesized in the cells are transported to the extracellular fluid, where they exert their influence at some distance from the secretory cells. Extracellular digestion is predominant in annelids, crustaceans, insects, cephalopods, tunicates, and all chordates except the lancelet. In most highly organized animals, the distance between the secretory cells and the cavities in which the digestive enzymes are active is large, for example salivary glands and the pancreas in mammals. Extracellular digestion that occurs in special cavities is usually referred to as cavitary digestion. Extracellular digestion may also occur outside the organism that produces the enzymes. For example, insects inject digestive enzymes into immobilized prey, and bacteria release a variety of enzymes into the culture medium; these are examples of digestion that is both extracellular and extracavitary. Membrane-mediated digestion is effected by enzymes that are localized on structures of the cell membrane; it occupies an intermediate position between the extracellular and intracellular types of digestion. In most highly organized animals, such digestion takes place on the surface of the membranes of the intestinal microvilli. Membrane-mediated digestion is the principal mechanism of the intermediate and final stages of hydrolysis. It is a mediator between digestion and transport, bringing these two processes as close together in space and time as possible. The digestive and transport functions of the cell membrane are united by a special digestive-transport conveyer that transports the end products of hydrolysis from an enzyme to a transporter or directly into the transport system (see Figure 2). Membrane-mediated digestion is found in man, mammals, birds, and amphibians, as well as in fish, cyclostomes, and many invertebrates, including insects, crustaceans, mollusks, and worms. Each of the three basic types of digestion have both specific advantages and limitations. These digestive processes have been combined to some degree by most organisms in the course of evolution; optimal efficiency and economy in the functioning of the digestive system is achieved when all three mechanisms are combined in a single organism. In man, in higher animals, and in many lower animals, the digestive apparatus consists of divisions that perform specific functions: (1) ingestion; (2) transport (in some species the transport division widens to form a special receptacle); (3) digestion, which occurs in two divisions—one for breaking up food and performing initial stages of digestion (in some cases digestion is completed in this division) and one for subsequent digestion and absorption; and (4) water absorption (the division for water absorption is especially important in terrestrial animals, with most of the water that enters the intestine being absorbed here; this was first discovered by the British scientist J. Jennings in 1972). The food mass in each division is either retained for some time or transferred to the next division, depending on the properties of the food and the specialized function of the division. Oral cavity. In the oral cavity in mammals and most other vertebrates and in invertebrates, food undergoes both mechanical grinding by chewing and initial chemical processing by saliva, which soaks the food mass and helps form the alimentary bolus. In humans, food remains in the mouth for an average of ten to 15 seconds. In man and omnivores, the main digestive activity in the oral cavity is the degradation of carbohydrates by salivary amylase. The taste organs are also located in the oral cavity, especially on the tongue. By movements of the tongue and cheeks, the alimentary bolus is brought to the root of the tongue, at which point it is swallowed, passing first into the esophagus and then the stomach. Stomach. Food collects in the stomach, where it is mixed and saturated wih acidic gastric juice, which exhibits enzymatic activities, pronounced antibacterial properties, and a capacity to denature cell structures. The principal function of the stomach is to store food and to process food chemically and mechanically as part of the initial stage of digestion. The main activity is the chemical degradation of proteins by proteolytic enzymes. Gradually, the stomach empties the food mass into the intestine. Depending on its quantity and composition, food can remain in the stomach for four to ten hours, with 3.5 to four hours being the average time in man. In many animals, the stomach has several compartments that perform different functions. In ruminants, for example, the main transformations of the food mass occur in the stomach through the activity of bacteria and protozoans. The mucous membrane of the stomach secretes inactive pepsinogen that is activated in the presence of hydrochloric acid and transformed into active pepsin, which is responsible for the initial stages of hydrolysis of proteins. The other secretions of the gastric mucosa are parapepsins, gastricsin, gelatinase (which under natural conditions appears to split collagen in connective tissue), and cathepsins (which take part in gastric digestion in the early stages of ontogeny). The gastric juice of some ruminants during lactation contains rennin, or chymosin, which causes curdling and subsequent splitting of casein. Unlike pepsin, rennin is active in a weakly acidic or neutral medium. A small quantity of lipase plays a relatively insignificant role in gastric juice. Prior to its denaturation by hydrochloric acid, salivary amylase continues the splitting of carbohydrates that began in the mouth. Also active in the stomach are the enzymes of pancreatic juice, which is released by antiperistaltic movements mainly during the ingestion of fatty food. Intestine. The food mass enters the intestine from the stomach bit by bit. Enzymatic hydrolysis and the initiation of absorption are most intensive in the intestine, especially in the initial segment of the small intestine, where digestion takes place in an almost neutral medium. The transition from acidic digestion in the stomach to digestion in a neutral or weakly alkaline medium in the small intestine is typical of man and higher animals; in lower multicellular and unicellular organisms, first an acidic and then an alkaline reaction is maintained in the digestive vacuoles. In higher animals and man, most supramolecular aggregates and large molecules—that is, proteins, products of incomplete protein hydrolysis, carbohydrates, and fats—are split in the lumen of the small intestine chiefly by enzymes that are secreted by the pancreas and that reach the duodenum. Unsplit proteins and the peptides that are formed by gastric pepsin are hydro-lyzed by the pancreatic-juice proteases—trypsin, chymotrypsin, the carboxypeptidases, and elastase. The successive action of these enzymes in the small intestine results in the formation of low-molecular peptides and a small quantity of amino acids from large protein molecules and polypeptides. The carbohydrates starch and glycogen are hydrolyzed by the α-amylase of pancreatic juice into trisaccharides and disaccha-rides with no significant accumulation of glucose. Bile, which is released by the liver, plays an important part in the hydrolysis of fats. It activates the lipase in pancreatic juice and emulsifies fats, thereby enlarging the surface of contact between the fats and lipase, which is dissolved in the water phase. Lipase splits off the fatty acids from fats step by step in the small intestine to form diglycerides and monoglycerides and a small quantity of free fatty acids and glycerin. By the mixing movements of the intestinal musculature the hydrolytic products come in contact with the intestinal surface, where they are further processed through membrane-mediated digestion. The absorption of water by the intestinal cells forms a solvent current that transports the hydrolytic products, which have a high surface activity, into the region of the brush border of the intestinal wall. The intermediate and concluding stages of digestion are effected by enzymes that are localized on the surface of the membranes of intestinal cells, where absorption starts. Two broad groups of enzymes take part in this membrane-mediated digestion: the enzymes in pancreatic juice and the intestinal enzymes proper. The former group includes α-amylase, lipase, trypsin, chymotrypsin, and elastase; these are adsorbed onto different layers of the glycocalyx—the three-dimensional mucopolysaccharide network that covers the microvilli. The intestinal enzymes proper include γ-amylase, oligosaccharidases, disaccharidases, tetrapeptidases, tripeptidases, and dipeptidases, as well as aminopeptidase, alkaline phosphatase and its isoenzymes, and monoglyceride lipase. These are synthesized by intestinal epithelial cells and transported to the surface of the cell membranes, where they perform their digestive functions. The adsorbed enzymes of the pancreatic juice are chiefly responsible for the intermediate stages of hydrolysis of food, while the intestinal enzymes proper carry out the concluding stage. Oligopeptides that enter the region of the brush border are split into amino acids, which—with the exception of glycylglycine— can be absorbed; some dipeptides that contain proline and hy-droxyproline are also directly absorbed. Disaccharides that enter with food and that form as a result of the digestion of starch and glycogen are hydrolyzed by the intestinal glycosidases to monosaccharides, which are then transported across the intestinal barrier into the internal environment of the organism. Tryglycerides are split both by pancreatic-juice lipase and by an intestinal enzyme, monoglyceryl lipase. Fatty acids and β-monoglycerides are absorbed. Long-chain fatty acids are newly esterified in the mucosa of the small intestine and enter the lymph as chylomicrons, which have a particle diameter of about 0.5 μ. The blood takes up more short-chain fatty acids (which are not resynthesized) than lymph. In general, a large part of the triglycerides, glycoside bonds, and peptide bonds is split during membrane-mediated digestion. Unlike cavitary digestion, membrane-mediated digestion takes place under sterile conditions; these are effected by the microvilli of the brush border, which acts as a bacterial filter that spatially separates the concluding stages of food hydrolysis from the intestinal lumen, which is inhabited by bacteria. Microorganisms normally play a major role in digestion, and in some animals the protozoans that inhabit different portions of the alimentary canal are a significant factor. The distribution of the digestive processes is uneven both along the length of the small intestine and along the axes between the crypts and the apexes of the villi. This uneven distribution is reflected in the corresponding topography of each digestive enzyme that participates in the cavitary and membrane-mediated forms of digestion. There is virtually no digestion in the large intestine, which contains only a small quantity of enzymes and an abundance of bacteria that cause carbohydrates to ferment and proteins to decompose. The products of the bacterial reactions are organic acids, carbon dioxide, methane, and hydrogen sulfide; the toxic products phenol, skatole, indole, and cresol are neutralized in the liver. Cellulose is split by microbial fermentation. The large intestine is primarily the resorption site for water, some minerals, and organic constituents of chyme. It absorbs up to 95 percent of the ingested water. It also absorbs some vitamins and amino acids that are produced by the microbes of the intestinal flora as well as electrolytes and glucose. The intestinal contents form compact feces as they move through the intestinal lumen, eventually triggering the act of defecation. Regulation. The functioning of the digestive systems depends on the composition and quality of the ingested food, a fact that was first confirmed experimentally by I. P. Pavlov. A definite connection between diet and the composition of a particular species’ various digestive enzymes exists. For example, proteolytic enzymes are dominant in predators, and carbohydrases in herbivores. Adaptive, compensatory changes in the enzymatic systems that are involved in membrane-mediated digestion also depend on the nature of the diet. Differences in composition between digestive enzymes may be either phenotypic or genetic in origin. For example, feeding can stimulate both the secretion and the synthesis of enzymes, while the composition of the diet may determine the correlation of these enzymes in a particular organism. Fats, proteins, and carbohydrates are digested in the alimentary canal in that order. Coordination of the activity of the digestive system is both neural and humoral. For example, the parasympathetic nervous system stimulates gastrointestinal motility, which in turn is inhibited by the sympathetic system. Some hormones, particularly those that are released by the adrenal cortex and the anterior lobe of the pituitary gland, influence the synthesis of digestive enzymes as well as the digestive-enzyme-mediated transport and incorporation of intestinal enzymes proper into the lipoprotein complexes within the membranes of the microvilli. Hormones also control absorption, motility, and secretion. A delicately balanced relationship exists between the type of food, the duration of digestion, and the rate of food movement along the alimentary canal. The relationship is controlled in part by local regulatory factors and mostly by reflex mechanisms. Signals that come from receptors in most of the digestive organs analyze, for example, the properties of food in the oral cavity and thereby take part in regulating the activity of the digestive system. Digestive disorders arise when the secretory, motor, absorptive, or excretory functions of the digestive organs are impaired (see GASTRITIS, HELMINTHIASES, HEPATITIS, DYSPEPSIA, CONSTIPATION, COLITIS, TUMOR). Prevention of digestive disorders requires adherence to a sensible, balanced diet and maintenance of general sanitiary and hygienic standards. Babkin, B. P. Vneshniaia sekretsiia pishchevaritel’nykh zhelez. Moscow-Leningrad, 1927. Pavlov, I. P. “Lektsii o rabote glavnykh pishchevaritel’nykh zhelez.” Poln. sobr. soch, 2nd ed., vol. 2, book 2. Moscow-Leningrad, 1951. Babkin, B. P. Sekretornyi mekhanizm pishchevaritel’nykh zhelez. Leningrad 1960. Ugolev, A. M. Pishchevarenie i ego prisposobitel’naia evoliutsiia. Moscow, 1961. Ugolev, A. M. Membrannoe pishchevarenie: Polisubstratnye protsessy, organizatsiia i reguliatsiia. Leningrad, 1972. Bockus, H. L. Gastroenterology, vols. 1–3. Philadelphia-London, 1963–65. Davenport, H. W. Physiology of the Digestive Tract, 2nd ed. Chicago, 1966. Handbook of Physiology, section 6: The Alimentary Canal, vols. 1–5. Washington, D.C, 1967–68. Jennings, J. B. Feeding, Digestion and Assimilation in Animals, 2nd ed. London, 1972. Preferential dissolving of mineral constituents in concentrations of ore.
Liquefaction of organic waste materials by action of microbes. Separation of fabric from tires by the use of hot sodium hydroxide. Removing lignin from wood in manufacture of chemical cellulose paper pulp. 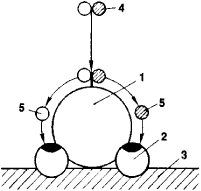 The process of sewage treatment by the anaerobic decomposition of organic matter. The process of converting food to an absorbable form by breaking it down to simpler chemical compounds. At the gelatinized starch level, notably Ct-MGAM has a high digestion activity of about 80% without alpha-amylase participation. Dr Sandra Esteves, director of the Wales Centre of Excellence for Anaerobic Digestion, University of Glamorgan; www. The anaerobic digestion facility will be a vital piece in the jigsaw to enable us to increase our recycling rates and to divert more waste away from landfill than ever before. The widely used digestion method before the quantitative determination of Pb by various techniques, in different type of samples including biological and environmental [13, 14], water and food , as well as poultry feed samples , is microwave-assisted acid digestion. Along with the many ingredients specific to healing the digestive tract and restoring balance, IDF also contains small amounts of enzymes to assist stomach enzymes in the digestion process. Developers that wish to build an anaerobic digestion plant can receive subsidies from the government. STRUCTURAL ANALYSIS OF NEW ANTIHYPERTENSIVE PEPTIDES DERIVED FROM CHEESE WHEY PROTEIN BY PROTEINASE K DIGESTION. It will use the emerging new technology of thermal hydrolysis advanced digestion, in which more than 500,000 tonnes of sludge - from the treatment of domestic sewage and industrial effluent from a population equivalent of 1,000,000 people - will be reduced to about 60,000 tonnes and will be used to generate electricity. Mansfield-based Monsal uses anaerobic digestion to break down organic matter to create biogas that provides the fuel for generators. The firm has put in an application to Staffordshire County Council for an 80,000 tonne per annum anaerobic digestion plant to be built at the company's waste management facility at Poplars, Cannock.